Who doesn’t want a unique lehenga for their wedding. We search so many stores and designers to lay our hands on our perfect lehenga. 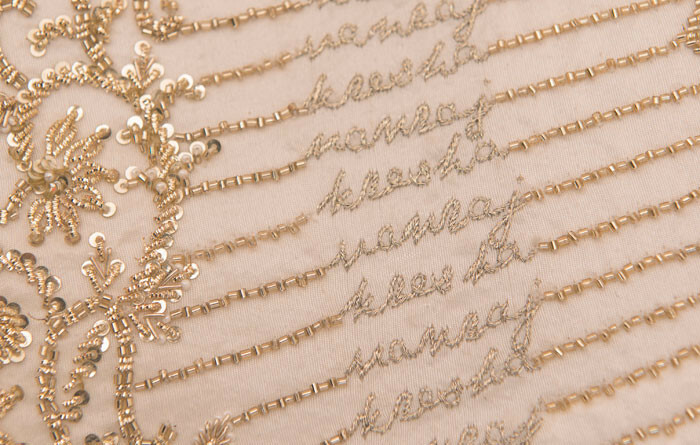 Designer Kresha Bajaj was no different when it came to her wedding. She had driven herself and everyone around her crazy in trying to find the perfect lehenga. “What was I going to do with a lehenga that would just sit in my closet, never to be worn again?” admitting that she has never been a fan of heavy traditional attire. Bajaj was inspired by the ‘Real Housewives’ television show star Adrienne Maloof who had framed her wedding dress as an art piece in her walk-in closet. I didn’t want to get sick of looking at my wedding outfit. The nicest thing we’d never get bored of looking at was our love story. And that’s what I decided to put into my lehenga. 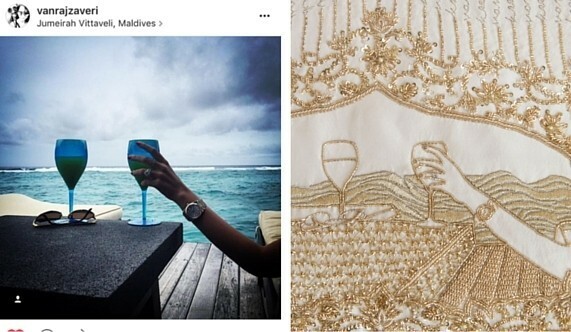 Her beau, Vanraj Zaveri, chose white and gold as the theme for their wedding trousseau, and Bajaj would spend hours with the karigars who were embroidering special milestones from the couple’s life together on to the cloth. 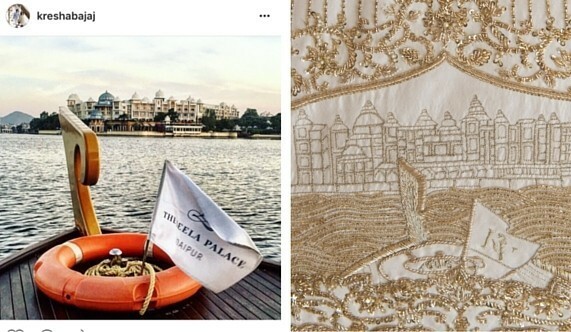 “This one of Leela Palace Udaipur, where we got married, is from the time when we were going to the hotel in a boat to finalise our weddings preparations,” she says. Vanraj Zaveri wore a white and gold silk sherwani that borrowed a simple floral pattern from Bajaj’s blouse. “We wanted to keep it really simple. He also made beautiful jewelled buttons for his outfit, and designed my wedding jewellery,” says Bajaj, who claims to have hated jewellery all her life, but was happy with her husband’s timeless designs.